It had been four years since I last visited Chile, a period in which the world’s wine industry has seen much change, and not all of it for the better. Global oversupply, downward pressure on prices and scrutiny from certain sectors of the health lobby, have all contributed to tough trading conditions for winemakers around the world. Chile boasts 40 per cent of the world’s copper reserves beneath its soil. Copper accounts for 47 per cent of the value of all exports, and behind comes lumber from a huge forestry industry. 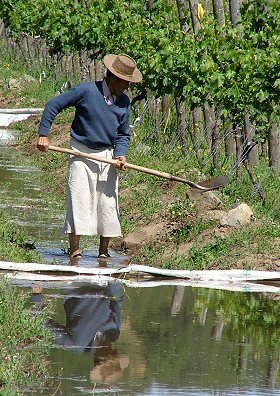 Fish and fresh fruit are the final linchpins of the Chilean export economy: Chile is the southern hemisphere’s biggest producer of apples, pears, plums, peaches, nectarines and grapes – though those are table grapes: the vineyards that feed the wine industry are of a relatively small scale by comparison. But Chile is a country that is hungry for commerce and to assume as prominent a role in the world economy as its natural resources, 15 million citizens, and their skills and ingenuity will allow. Renowned for its Phyloxera-free vineyeards and crystal-clear landscape, Chile’s wine industry is marching towards the next decade with confidence. Talking to dozens of winemakers on a trip to New Zealand last year, a common topic of discussion was Sauvignon Blanc and what a double-edged sword it has become for the Kiwi industry. Sure, being known as ‘The place that does brilliant Sauvignon’ is a coup that gives a small wine country enormous global visibility, but it is also a potential glass ceiling that could stifle other aspects of the wine industry. Chile, on the other hand, has a much more broad-based wine industry. The signature grape, Carménère, has some cachet, but a wide range of white and red varieties and styles shares equal billing. However, Chile does have its own double-edged sword to play with, and that is consumer perception of the entire country’s wine output. Mention Chilean wine to just about any wine drinker, from occasional weekend tippler to informed student of the grape, and their first reaction will almost certainly include phrases like “good value” or “good quality for the price”. Whilst these sentiments are positive, there is an implication that Chile is, by default, a cheap wine producer. Just as many consumers of New Zealand Sauvignon Blanc will be blissfully unaware of the country’s Chardonnay, Pinot Gris or Pinot Noir, most Chilean wine drinkers are unaware that £20, or even £10 bottlings exist. For most, ‘cheap and cheerful’ is the be-all and end-all of Chilean wine. The challenge for Chile is complex: it must consolidate its reputation as provider of large volumes of high quality wines at competitive prices, whilst at the same time moving the industry, and consumer perceptions, onto a new place. For long-term viability, Chile needs higher quality, higher price points, and it needs its wines to occupy other sectors of the collective wine consciousness. These problems are not unique to Chile perhaps, but they are quite starkly evident. In terms of quality wine, Chile will depend on export for the foreseeable future. Of the 7.89 million hectolitres produced in 2005, 4.21 million was exported. Along with the USA and Brazil, the UK remains the most important market. Domestically, annual per capita consumption is around 16 litres (actually slightly up on mid-90s figures against a pattern of falling global consumption), but the majority of that is very low-priced wine indeed. 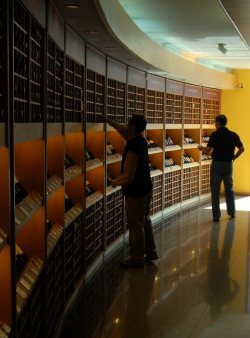 One sign of a growing interest in fine wines is the El Mundo del Vino chain of very smart wine shops in Santiago and other major cities. Browsing the shelves of a large, beautifully arranged store in Santiago’s posh El Golf district (left), the ‘icon wines’ of Chile were all present and correct, as were high-end wines from Europe, Australia and the USA. But when I spoke to the shop manager he confirmed that his big customers were visiting Brazilians, Americans and Japanese, but regular local clients were still relatively thin on the ground. 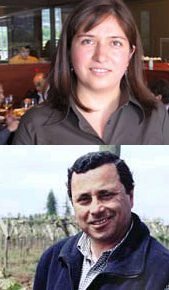 On an individual basis, many Chilean producers are pursuing a quality path, and striving after world-class wines. Some of these are through collaborations like the joint venture between Concha y Toro and Mouton-Rothschild, Almaviva, and some are quality- focused Chilean houses like Errazuriz and Montes, that offer ultra-premium priced bottlings to compete with the best in the world. 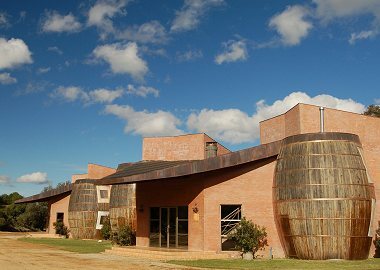 One interesting case in point is the modern winery of Via, near Talca. I last visited this winery in 2003, when it was deeply involved in a joint venture to make wines for Michel Laroche. It also had a burgeoning portfolio of clients for whom it made wine on contract, including Tesco own label. With vineyards across Chile’s regions, Via’s whole philosophy was to be an anonymous, client-led, totally flexible ‘wine machine’ that would make good wines at the right price for anyone who’d pay the going rate. Returning late in 2006 and it’s all change at Via. 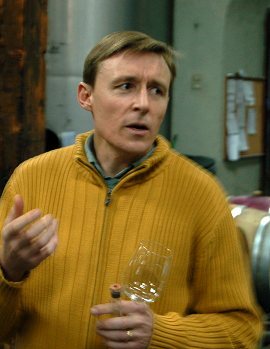 The Laroche relationship has ended, founder and former supremo Jorge Cordeche has taken a back seat (though still a shareholder) and winemaker Julian Grubb has been replaced by the well-travelled Californian Ed Flaherty (in fact, Flaherty, pictured below, has just moved on again to Viña Tarapacá). Though the Tesco own-label range is still an important backbone for the winery, Flaherty and the new management team have been reengineering and repositioning Via as a quality estate winery, with a number of single vineyard bottlings bearing Flaherty’s signature. A programme of grafting and replanting has attempted to play to the strengths of their terroirs. There does seem to be a new understanding amongst Chile’s producers that they must work together to raise standards and improve the world image of ‘brand Chile’. There is no better example of this than a project called Vinos de Chile 2010 centred on the Maule region. Maule is the huge, thumping heart of the Chilean industry, responsible for 50 per cent of all wine production. Maule has historically been Chile’s boiler-room, with massive plantings of the lacklustre País grape being used to churn out cheap wines. Though much of the País has now gone, low-end wine for bulk export has remained the region’s stock in trade. There are shining examples of aspirational, quality-conscious wineries across Maule of course, from the Chilean family-owned Valdivieso whose ever-improving range is moving steadily up the ladder of both quality and price led by Kiwi winemaker Brett Jackson (right), to the Kendall-Jackson-owned Calina, whose wines are ultra modern and very impressive, to slick new projects like Espiritu de Chile, a brand new label aimed specifically at the UK and German markets in a joint venture between Chile’s Aresti, who will grow the grapes and make the wines, and Germany’s Racke, who will market, sell and distribute them. The story of the ancient Bordeaux variety Carménère, and how it was rediscovered thriving in Chilean vineyards, is now well known. 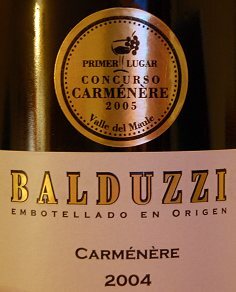 Carménère is still the name on many Chilean lips as a potential ‘golden ticket’, and indeed the promotion of Carménère wines through the annual Concurso Carménère in Maule is an integral part of Vinos de Chile 2010’s strategy. Clearly, the position of Shiraz in Australia, Sauvignon Blanc in New Zealand, not to mention Malbec in Argentina, is the role model. Many Chileans expressed a belief that their neighbour across the Andes was a sleeping giant, who might just become the dominant force in South American wine if Chile does not get its collective act together. As one of the judges for last year’s Concurso Carménère, I tasted my way through 50-odd examples. Criticised for an element of herbaceousness that can verge on the aggressively green, the pyrazine character of some Carménère (ironically also found in New Zealand Sauvignon Blanc where it sits more happily) is being managed by better understanding of the canopy, yields and irrigation, but was still evident in a few wines. At its best it adds an intriguing menthol, herby note; at its worst it is unpleasantly vegetal. But the overall quality of Carménère was very good indeed, perhaps being best of all in the section of Carménère-dominant blends. When blended with other Bordeaux varieties and occasionally Syrah, the slightly one-dimensional tendency of the grape can be smoothed, fattened or spiced into a more harmonious wine, yet still retaining its distinctive Carménère signature. Indeed Chile remains a bastion of single varietal wines, yet the future for the best reds might well be in blends, with Carménère providing a decisive point of difference. The arrival in 1979 of Spanish superstar Miguel Torres sparked the modern Chilean wine industry: it is hard to imagine that Torres brought stainless steel fermentation tanks to the country for the very first time. The quality Chilean industry is still finding its feet in many ways. Plantings have moved from flood-irrigated vines on the valley floor, trained on high pergolas, to lower trellises on sloping sites, with drip irrigation. The Primavera vineyard of Valdivieso illustrates this perfectly, with fruit from the flood irrigated bottom section of the vineyard (right) being used in cheaper wines, and fruit from drip-irrigated high slopes, recently cleared of mountain rubble, designated for upper-end wines. At Mont Gras, the mountain top Ninquén vineyard at over 1600 feet is a prime example of the upward movement. And exploring of new regions goes on apace. Where once Casablanca had ‘cool climate winemaking’ all to itself, vineyards are creeping north and south, but also outward towards the Pacific to the west and Andes to the east in search of not only cool climatic conditions, but new and interesting soils and subsoils. A good example is the recently planted Limarí region, some 500 kilometres north of the previous limit of viticulture. Though creeping closer to the Atacama Desert, its proximity to the ocean cools and extends the growing season. Quality names like Viña Tabali have emerged from Limarí, and stalwarts like Concha y Toro are investing heavily. Valdivieso is currently looking at expanding exports into the middle and far east amongst others, where there is the hope of a better profit margin that the more traditional markets like the UK and USA. Their search, and of course the holy grail for many, is not necessarily to sell more wine, but to sell it at higher price. Aware that better bottom line profitability for a wine company comes through raising quality, quietly but steadily, Kiwi winemaker Brett Jackson (left) has been improving Valdivieso’s wines across the board. He has built a ‘winery within a winery’ at their Curico base, with a sorting table, basket press and battary of specially-designed fermenters where he creates an expanding range of super-premium wines that really impressed me. The non-vintage multi-blend Caballo Loco, one of the first Chilean ‘icon wines’ is now onto edition eight, and was sensational. But a new premium Rhône blend, from 80-year old Carignan, Mourvèdre and Syrah, was excellent, and a soon to be released top of the range cuvée called Plenus uses a selection of the very best Cabernet and Malbec to brilliant effect. It will be the new flagship wine. Valdivieso’s wines are imported into the UK by Bibendum. for tasting notes on 10 wines from Valdevieso. The San Pedro name will be best known for their massive-selling supermarket brands 35 Sur and Gato, that are staples of British supermarket shelves. 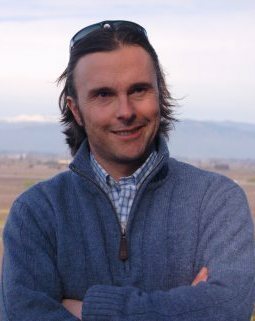 Recently appointed winemaker at the company’s Molina winery is Marco Puyo (left), previously of Los Vascos, and who along with consultant winemaker Paul Hobbs from California, is charged with developing the company’s reserve lines. The 500,000 cases of 35 Sur have their own winemaking team in place. 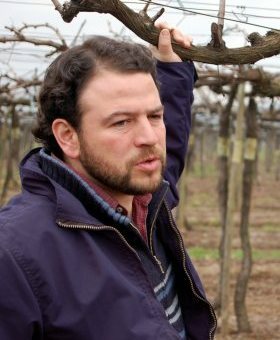 Marco sees his challenge as improving quality, and he is moving towards single vineyard wines for the 1865 and Cabo de Hornos ranges. San pedro’s wines are imported into the UK by Buckingham Vintners. for tasting notes on 10 wines from San Pedro. The Aresti group is family-owned. As well as their sizeable wine operation with 400 hectares of vines, Aresti also has the largest rice company in Chile, the No. 2 pet food brand, and is one of the top 10 producers of fresh fruit. 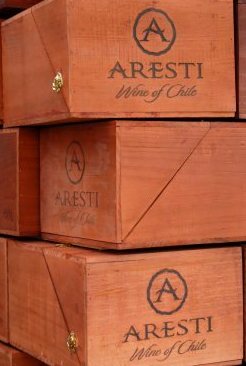 Around 40 per cent of Aresti’s production is still shipped in bulk, but the quality of their bottled wines is proved by a clutch of gold medals in the International Wine Challenge and competitions in Europe and Chile. Espiritu de Chile is a new range, made primarily for the UK and German markets, in a 50/50 partnership between Racke of Germany and Aresti. Aresti produces the wines in Chile, with some input from German winemakers, and Racke uses its expertise to sell and distribute in Europe. for tasting notes on 10 wines from Aresti. Wine production on this estate in Curico goes back several centuries to the arrival of the Spanish Conquistadores. The Hacienda El Condor winery with its adobe walls and traditional manor house dates from the early 20th century. Though the Millaman name is less familiar to UK fans of Chilean wines than some, this is a premium wine estate where quality struck me as extremely high. Winemaker for Millaman (the name means ‘golden condor’ in an ancient local language) is Pascal Marty (left) who has worked at Mouton-Rothschild and Opus One amongst others. Pascal has very definite ideas about his vineyards and terroir here in Curico. Pascal retains the old high trellises pictured for Sauvignon Blanc because it suits the vines, but has adopted low-trained systems for others, all in a relentless quest to match vine to soil to viticultural practice. The UK importer of Millaman’s wines is Alexander Hadleigh. for tasting notes on 10 wines from Millaman. Via was established as a contract winemaking operation, with quality vineyards across Chile. The last few years have seen a change of philosophy: Via is still an important contract winemakers (all of Tesco’s own label Chilean wine for example), but is trying to change the operation to also become known as a producer of premium quality estate wines. 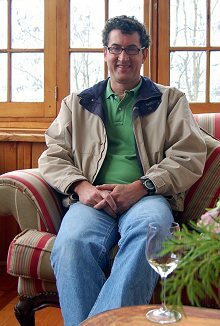 A significant part of that plan was the recruitment of winemaker Ed Flaherty. Though Flaherty has moved on since my visit (to Viña Tarapacá), his remit was all about improvement and change. Via’s vineyards were planted during what Flaherty calls “the red boom,” but under his direction there has been a move towards whites, and a programme of re-grafting Cabernet Sauvignon to other varieties. Organic farming of one large vineyard has also been abandoned after nematode infestation dramatically affected the vines. Flaherty’s mission was to improve the matching of vines to soils and climates, and that work goes on. Via’s wines are distributed in the UK by Bibendum. for tasting notes on six wines from Via. 1994 was the first vintage for this winery, created by a group of Chilean investors. The estate comprises to 85 hectares of vines, with vineyards in Maule and Cholchagua. Cabernet Franc, Cabernet Sauvignon, Carmenère, Chardonnay, Malbec and Merlot are the main varieties planted, with some Sauvignon Blanc and Syrah too. There are four ranges, topped-off by the Gran Reserva, with the introductory Valle Andino expected to retail for around £3.99 in the UK. Yields are relatively low, grapes are picked by hand, and oak is used judiciously. Constellation Brands is the UK importer of these wines. for tasting notes on two wines from Terranoble. Calina is a modern estate owned by California’s Kendall Jackson, who bought it from its former Argentine owner when the Argentinean Peso was devalued around 2000. Kendall Jackson also owns Yangarra in Australia, Villa Arceno in Tuscany and Château Lessague in St Emilion amongst others, and indeed, I found the range of wines being produced here to be distinctly ‘international’ in style. But the wines are excellent, and do retain a distinctive Chilean personality. That’s not just though vinifying grapes like Carmenere, but from a local team given plenty of autonomy and led by Chilean winemaker Marcela Chandía (top left) who has worked in California, South Africa, New Zealand, Portugal and France, and Vineyard Manager Ricardo Marín Irigoyen (bottom left). 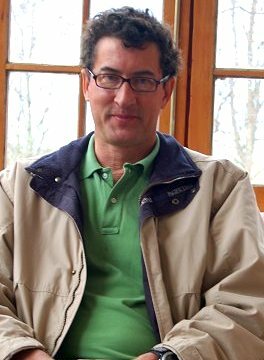 During the last four years of Kendall Jackson ownership the vineyards of Viña Calina have been transformed, with flood irrigation techniques replaced by drip-systems, and a new regime of vineyard management to avoid excess vegetation of both leaves and bunches, cutting back yields quite drastically. Kendall Jackson has its own UK importing business. for tasting notes on three wines from Calina.